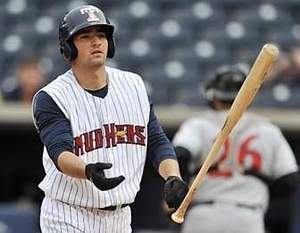 Nick Castellanos, the 44th-overall pick in the 2010 First-Year Player Draft by the Detroit Tigers out of Archbishop McCarthy High School (Florida), has been on a roll as of late for Triple-A Toledo in the International League. In his last ten games, Castellanos has batted .450 (18-for-40) with three home runs and 10 RBI, along with an impressive OBP/SLG/OPS line of .521/.750/1.271. Castellanos’ recent success has capped a strong season in which he has batted .300 (81-for-270) with 10 home runs and 38 RBI in 69 games. In all, Castellanos has had 23 multi-hit games this season, 10 of those in which he registered three or more hits. Coming into professional baseball, Castellanos was slotted as a third baseman, but has since transitioned to the outfield as means to focus attention on his offensive game…and what an offensive game that is. Castellanos is one of, if not the best pure hitter in the minor leagues, as he is able to effectively adjust to different pitches and rake the ball to all fields with ease. He has a strong frame (6-4, 210) and the bat speed to possess above average power at the next level, which will come with time. Castellanos has improved in terms of plate discipline, hitting variability, and adding pop to his bat with Toledo, as his strikeout rates are slightly down and power numbers are up from last season at both High-A Lakeland and Double-A Eerie. Detroit does not appear to have any plans or apparent space for Castellanos at the moment; however, if Detroit loses confidence in their current outfield core, Castellanos may receive a call-up to platoon with Don Kelly, Matt Tuiasosopo, and even Andy Dirks, which may also give a cushion for everyday veteran Torii Hunter and Austin Jackson, who recently rejoined Detroit following a month-long stint on the DL. Either way, Castellanos looks poised to continue tearing apart International League pitching and cementing his status as the best pure hitter in the minor leagues.